Who hasn’t heard that statement in some form growing up? But where did tea originate? Collections of books have been written through the ages about tea and its origins, production and traditions, but China is considered to have the earliest records of tea use in history dating back to the first millennium BCE. Introduced by the Dutch in 1606, tea from China, and later India, was bought by the wealthy as a fashionable drink. It seems during vast ship explorations all over the world that tea seeds were brought from China by merchants of Japan, Sri Lanka and Russia. Certainly a great deal of evidence points to China as the original home of the tea tree. Fast forward to 18th century Europe, tea was an expensive, precious and highly valued commodity. It was Carl Linnaeus – a Swedish botanist, physician, and zoologist, known as the father of plant classification, that named the tea plant ‘thea sinensis’ China tea. Today, the largest producers of tea in order are China, India, Kenya, Sri Lanka and Turkey. Tea is derived from the plant, camellia sinensis, which contain chemicals called polyphenols, which give tea its antioxidant properties and seems to protect cells from the DNA damage. You may have heard or even sampled the various types of teas such as black, green, white and oolong teas. They are all made from the leaves of the camellia sinensis plant. What makes the main four tea types different from each other is the way the leaves are prepared and how mature they are, which affects both flavor and nutritional content. Black tea is made from leaves that have been wilted (dried out) and then fully oxidized (meaning that chemicals in the leaves are modified through exposure to air). Green tea’s leaves are wilted but not oxidized. Oolong tea is wilted and then only partially oxidized, and White tea is not wilted or oxidized at all. 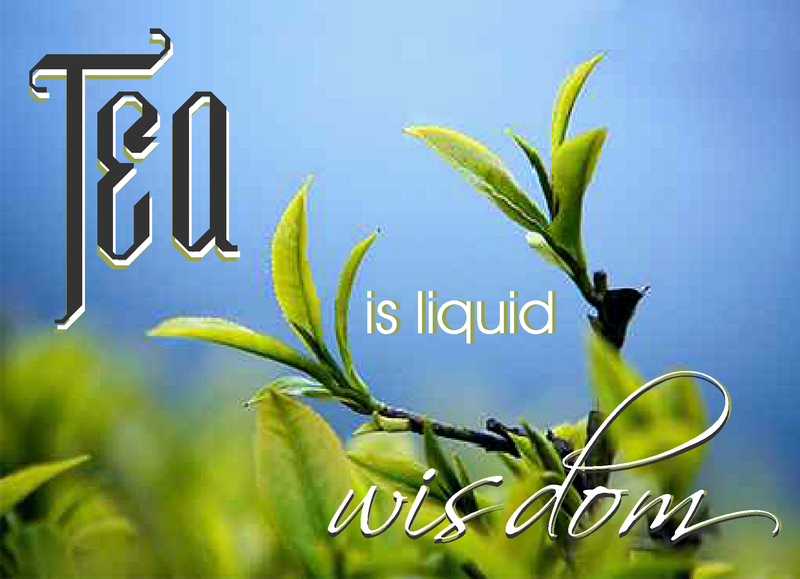 Green tea contains an especially high amount of antioxidants—in particular, a type of polyphenol called a catechin. 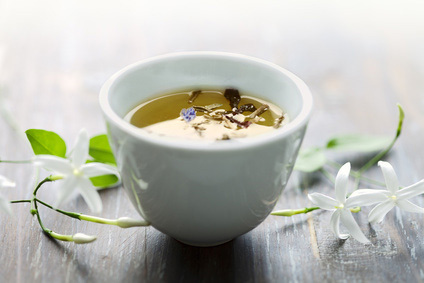 White Tea contains the same polyphenol antioxidants as green tea but is believed to be more beneficial to your health because it undergoes less processing. mixed with dried scented flowers, usually jasmine or Yulan (a kind of magnolia). 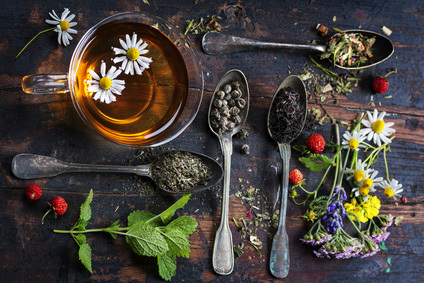 Herbal teas, like chamomile and peppermint, are technically not considered tea as they are infusions of other plants with different nutritional characteristics. Rooibos tea is also an herbal tea. It is 100% caffeine free, and it is not made from the tea plant. Instead, it is a tea-like beverage made from a plant native to South Africa. It tends to have a rich red color and an earthy flavor that is slightly fruity. Tea is a zero calorie beverage which also contains fluoride for strong teeth. 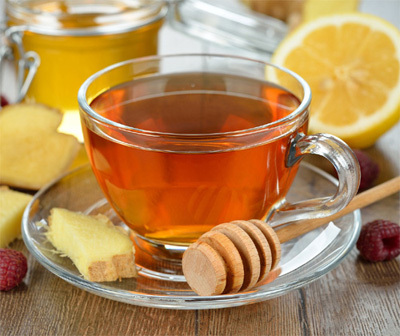 Tea also contains numerous amino acids, as well as a variety of vitamins and minerals that are said to help stimulate the immune system, help aid digestion, help lower cholesterol and more. Teas whether they are considered trendy or traditional – why not sip your way to a sense of well-being? We invite you to savor our collections of Arlys Aromatic Herbal Teas. ARLYS Aromatic Herbal Teas are fine loose teas with an exotic array of custom blends using the highest quality ingredients for exciting tastes and aromas. This entry was posted in Aches and Pains, Arlys In The Media, Essential Oils A-L, Essential Oils K-Z, General, Respiratory Issues, Skin Care. Bookmark the permalink.